In pursuance of the provisions of the Section 7 of the Aadhaar (Targeted Delivery of Financial and Other Subsidies, Benefits and Services) Act, 2016 the Department has issued a notification dated 8th February, 2017 for the use of Aadhaar as identity document for delivery of services/benefits/subsidies that simplifies the Government delivery processes, brings in transparency and efficiency and enables beneficiaries to get their entitlement directly in a convenient and seamless manner and Aadhaar obviates the need for producing multiple documents to prove one’s identity. An individual eligible to receive the subsidized food grains/Cash Transfer of Food Subsidy under NFSA and having valid Ration Cards issued by State Governments/UT Administration is required to furnish proof of possession of Aadhaar number or undergo Aadhaar authentication. Any new eligible beneficiary who is selected by State Governments/UT Administration for receiving subsidized food grains/Cash Transfer of Food Subsidy under NFSA is also required to furnish proof of possession of Aadhaar number or undergo Aadhaar authentication. All such eligible beneficiaries entitled to receive subsidized food grains/Cash Transfer of Food Subsidy under NFSA, who do not possess the Aadhaar number or, are not yet enrolled for Aadhaar, but are desirous of availing subsidized food grains/Cash Transfer of Food Subsidy under NFSA are required to make application for Aadhaar enrolment by 30th June, 2017, provided he or she is entitled to obtain Aadhaar as per Section 3 of the said Act. The said time limit has been extended upto September, 2017 which covers the people residing in remote areas like Jaisalmer and Bikaner in Rajasthan. For effective implementation of and bringing transparency in Public Distribution System (PDS), Government is implementing a scheme on “End-to-end Computerization of Targeted Public Distribution System (TPDS) Operations”. The component-I of the scheme comprises digitization of ration cards/beneficiary and other databases, online allocation, computerization of supply-chain management, setting up of transparency portal and grievance redressal mechanisms. Besides, Central Govt. 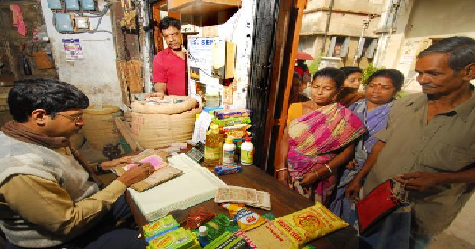 has also asked States/UTs to opt for any of the two models of Direct Benefit Transfer – Cash transfer of food subsidy into the bank account of beneficiaries or Fair Price Shop (FPS) automation, which involves installation of Point of Sale (PoS) device at FPS, for authentication of beneficiaries and electronic capturing of transactions. The cash transfer of food subsidy is being implemented in 3 UTs namely Chandigarh, Puducherry w.e.f. 1-9-2015 and partially in Dadra & Nagar Haveli w.e.f. 1-3-2016. For remaining areas, States/UTs have been asked for Fair Price Shop (FPS) automation. So far, more than 2.45 lakh FPSs have been automated across the country.